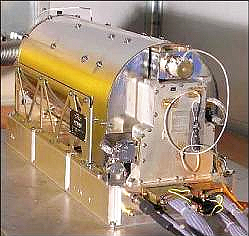 [SatNews] With a frequency stability equivalent to 1 second every 3 million years, the Passive Hydrogen Maser (PHM) is the most stable operational atomic clock for Space use ever built. The Maser was developed by SELEX Galileo, a Finmeccanica company. The European Space Agency's Galileo constellation will have SELEX Galileo's PHM atomic clocks on board. With exceptional stability and on-ground positioning precision of up to 30 cm, SELEX Galileo's Maser will guarantee the Galileo constellation can deliver highly precise navigation data, without synchronisation from ground control for over 8 hours. With SELEX Galileo’s PHM, the Galileo constellation’s positioning output will be almost 10 times better than the other currently operational satellite systems. The Maser atomic clocks are fitted on-board all of the Galileo constellation's 30 satellites. Each satellite also has a range of other SELEX Galileo technology integrated on board including the IRES-NE asset sensor (2 on each satellite) and the Electronic Power Conditioner (EPC) of the 7 SSPA covering 3 bands (from 1,19 to 1,57 GHZ) for the transmission of the satellite signal. Currently, SELEX Galileo has ongoing contracts with the European Space Agency (ESA), with funds from the Agenzia Spaziale Italiana (ASI) and Italian EU funds, for the development, engineering and manufacture of the pre-flight and flight Maser units. The Company is also developing a compact, low power consumption version of the Maser (the Mini-Maser), also for space applications. Swiss company SpectraTime is the principal subcontractor for the Maser. SELEX Galileo currently has 20 highly skilled technicians involved in the project, producing and testing the Maser systems. The Company is expecting to match its investment of financial and human resources in the next phase of the program.